Some parts of the gardens are currently being restored for their long-term conservacy. Theses works do not prevent the visit of any part of the estate. Thank you for your understanding. During 4 days, a small mobile scaffold will evolve around the four facades of the château for an urgent maintenance of the building’s façade. A security perimeter will be established for this works zone without hindering the visit circuit. 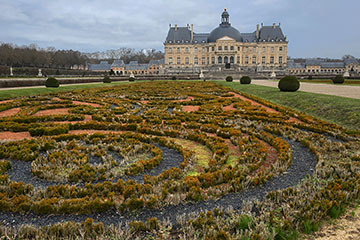 The boxwood parterres of the boulingrins, aging and diseased, have been uprooted to make way for an ephemeral work of art, created especially for the estate, and chosen from candidate proposals. The project, titled “Ephemeral Ribbons” was inspired by Achille Duchêne’s designs for his boxwood arabesques, themselves inspired by Le Nôtre’s embroidery patterns, but in modern materials. Eroded statues, leaking ponds,water jets dysfunction, etc. 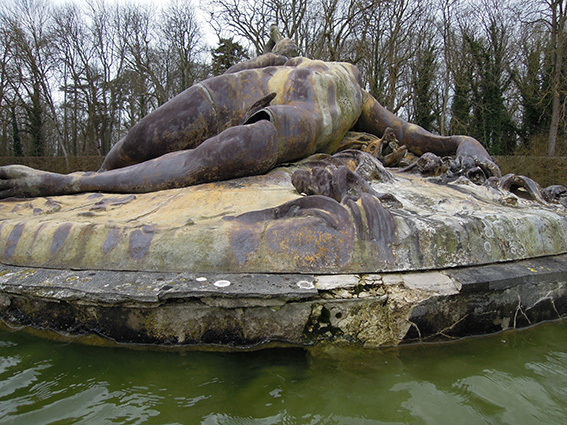 : the basins, statues and hydraulic network of the Triton fountains need an urgent restoration. This restoration implies sculpted pieces being temporary removed, Tritons and Great squarre mirror being emptied and impossibility to activate Triton and waterfalls fountains during the 2019 Water shows.